My wife and I love cinnamon. Perhaps there’s a distinctive taste in cinnamon that captures the attention of our taste buds. Though cinnamon is our favorite, its ironic that we seldom use it in the kitchen. I remember I’ve only used it once when I tried to make kamote que (fried sweet potato with sugar) with cinnamon. Maybe next time I’ll try to add it on bake goodies like in banana bread or in cookies. Combine flour, 1 cup sugar, baking soda and salt in a bowl. Whisk eggs, sour milk or buttermilk, and oil in a separate bowl. Mix egg mixture into dry mixture just until moistened. Mix 1/2 cup sugar and cinnamon. Set aside. Scoop batter into bread pan (about 1/4 of the pan filled) then sprinkle with cinnamon/sugar mixture. Repeat layer until the pan is filled up to 3/4. Use a small knife or fork handle then slightly swirl batter. Bake at 350 F for 45 to 60 minutes or until it pass the toothpick test. Let it cool for 10 to 15 minutes before removing from pans. Note: This recipe also appears at Houselements. 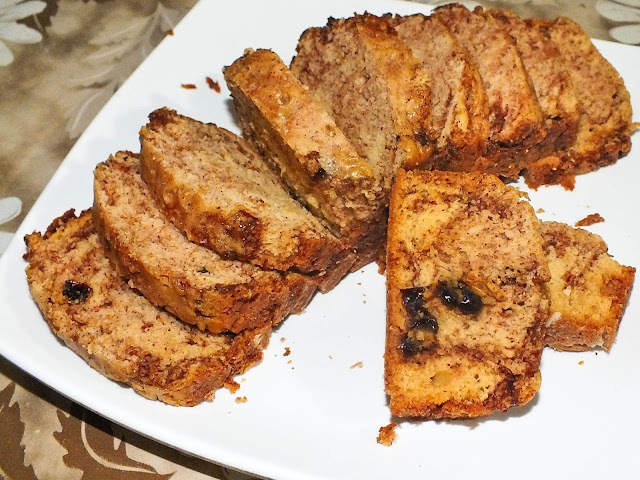 Check out the original post here Cinnamon Raisin Bread. © 2013, Ryan Lagunzad. All rights reserved.